Water pipes are responsible for safe delivery/passage of water. Any damage to these water pipes will affect the entire water supply of a house. 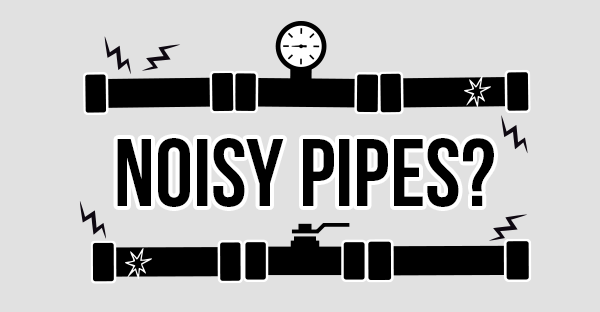 Noisy Pipe is actually a warning of faulty design of water pipes in Plumbing System. Now the question arises, how to recognize these defects in water pipes? Noise in the water pipe is a sign of ruining water pipe. If not fixed with time, they may damage completely and will have to be replaced immediately. Cause Sudden closing/turning of water flow. 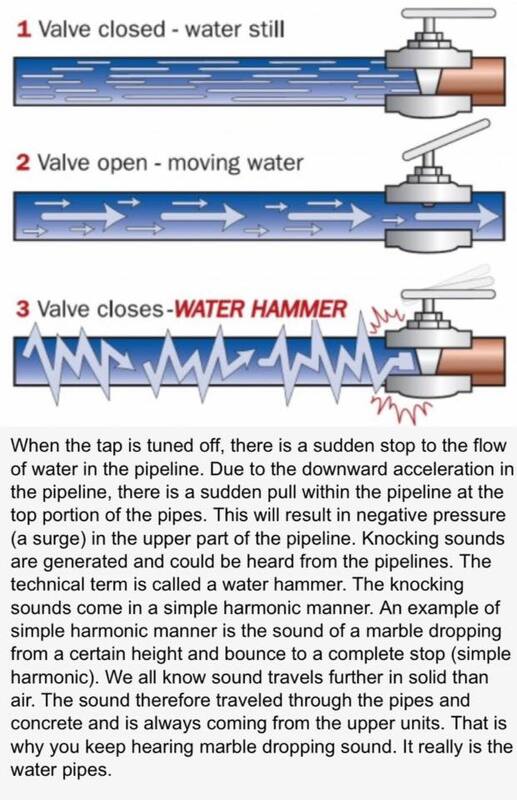 Water Hammer: It is a phenomenon that takes place when high pressure water running through pipe is forced stop or its direction is changed suddenly. Occurrence This happens when water is running and is then suddenly turned off/stopped. Due to this water has no place to go and hit against the shut-off valve or pipe walls causing banging noise in pipes. Threat Water hammer potentially damage joints and connections in the water pipe. When water flow exceeds the designed pipe diameter. Occurrence Whistling in pipe occurs when water is forced to pass through a smaller opening than the original plumbing components designed for. Sometimes whistling noise comes from faucets and valves, which is due to worn out washers. Threat Whistling pipes result in wear and tear of pipe and water mineral build-up in faucets and shut-off valves. Occurrence If water pipes are not strapped properly in place, they tend to move around when water is flowing through them. Threat It damages the pipe surface by rubbing against wall and lead to pipe failure. Noisy pipes are just the beginning and hence, if fixed in short time it will save your pipes and appliances from damaging. Previous PostPrevious 6 Must-Know Tips Before you Buy Furniture Online! Next PostNext Nails vs Screws: Which is Better for Furniture?